Spring is in the air, and that means the scent of barbecued food should be, too. Before you fire up your grill for what is probably the first time in months, you should make sure it is in good working order. 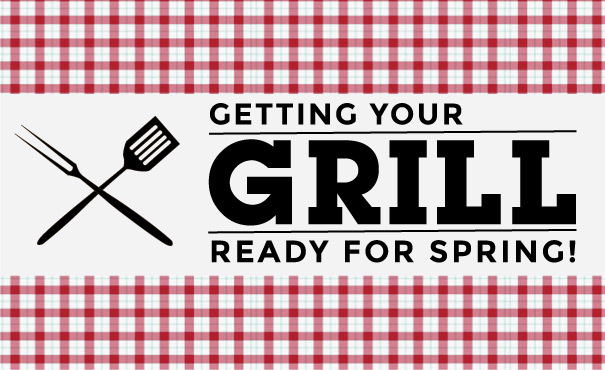 These hints can help you ensure that your grill is clean, safe, and ready to use this spring. You can do a lot with just soap, water, and a sponge or paper towels. These cleaning necessities are ideal for wiping down the exterior of your grill, as well as getting rid of grease splatters on the interior, such as under the lid. You can also use disposable disinfectant wipes for this purpose. And if the exterior of your grill happens to feature stainless steel, you can use a stainless steel cleaner for that shine you seek. When it comes to cleaning the grates, you might need some stronger tools. A wire-bristled grill brush is a good example of a tool that is strong enough to remove everything from cooked on food to rust. You can also use sandpaper or a spatula to scrape off grease and other stains that may be difficult to remove with just a sponge. When you start to clean the grates, make sure you have a good grill brush on hand. If you wait until the day after cooking to get started, you can reduce the amount of elbow grease you will need by spraying the grate with a blend of equal parts water and vinegar. One hour after you spray this mixture, the residue should come off easily as you scrub. Or, you can choose to scrub the grates minutes after you get done cooking your food, since the residue is softer when it is still hot. Pay close attention to safety before you grill. If any hoses or tubing are bent or otherwise damaged, it may be best to replace them. You should also check the ignition parts, such as the electrode leads, scraping off any grease or other residue with sandpaper when necessary. In addition, you can perform a leak test by putting soapy water on the hoses, regulator, and valves. Once you turn on the propane tank, you should keep an eye out for bubbles, since this means gas is leaking out. If the bubbles remain even after you tighten all the connections, it’s time to replace the hoses or your tank. Last but not least, make sure you have enough propane before you start grilling! There’s nothing more disappointing than inviting hungry guests over and discovering that you’re out of propane.